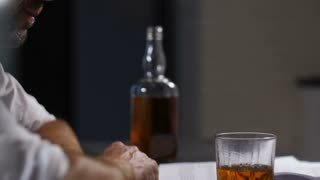 Bankrupt depressed middle aged entrepreneur sitting in despair alone at office desk, leaning his head on hands with bottle and glass of alcohol beverage placed on the table in front of him. Dolly. Middle aged white-collar employee in loose necktie drinking whiskey alone in stress and despair after receiving dismissal notice. Depressed business person drinking alcohol beverage after losing job. Close-up of overworked hopeless businessman leaning his head on hands with notifacation of company bankruptcy lying on the table. 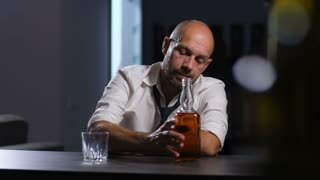 Depressed man avoiding problems in alcohol abuse indoors. Dolly shot. Middle aged alcoholic man thoughtful about alcohol addiction drinking indoors leaning hands on whiskey glass. 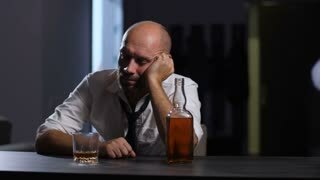 Depressed lonely adult businessman drinking whiskey trying to forget his problems. Dolly. 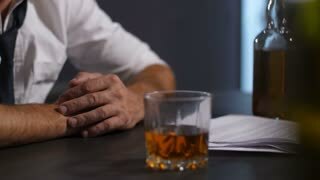 Portrait of handsome adult pensive man in midlife crisis leaning hands on glass of alcohol beverage thinking about problems and life while sitting in loneliness in dimmed room at home. Dolly shot. Portrait of exhausted middle aged businessman in formalwear relieving stress with alcohol beverage after hard day work at home. Tired entrepreneur sitting head in hands and drinking whiskey alone. Emotional caring loving wife leaning to her depressed alcoholic husband and feeling desperate while trying to take a bottle of alcohol from him.